Today I did something I hadn’t done in a long time: I finished reading a novel that I had begun reading just twenty-four hours earlier. It wasn’t a friend’s novel, it wasn’t a novel that I have to read for an awards panel, it wasn’t a book I was reading for research. There are piles of such books on my bedside table and in my office, but as I left for the weekend early yesterday morning, I decided to grab something off the bookshelf that I hadn’t yet read, but had bought long ago. Are you a Jim Thompson fan? (I’m sure I’ve written about him before.) To call Thompson’s crime fiction seminal to the genre would be a vast understatement. You can read all about him here, if you want the quick and sad description of his life and work and quotes from the famous writers who claim him as an influence. I didn’t know about Thompson until I saw the film The Grifters when it came out in 1990. Soon after, P educated me to the fact that he was the novelist behind Peckinpah’s film, The Getaway, which starred Steve McQueen and Ali MacGraw. So I bought six or seven of Thompson’s novels right away. My favorite Thompson novel is the relentlessly bleak and disturbing The Killer Inside Me. 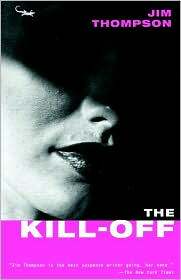 This weekend I read The Kill-Off for the first time. The reader knows right away that it’s the cruelly manipulative, bed-ridden town gossip who will die, though four-fifths of the novel passes before the murder occurs. Everyone in town has a motive for murdering her. I was four chapters into it before I realized that each chapter of the novel was written from the point of view of a different character–and each of those characters only gets one shot to tell his or her part of the story. It’s not the tightest of Thompson’s novels, but I loved it. Thompson’s work always reminds me that a novel needn’t be highly-polished or politically correct or bursting with elegant vocabulary to be a good read or even to embody that elusive quantity called literature. There’s one other thing that I like about Thompson’s novels. Aside from the occasional sociopath, not one of his characters is necessarily admirable or could be labeled as good. Nor could they be called bad. They’re deliciously complex. Some might call Thompson’s approach nihilistic or despairing. I would call it human. TUESDAY: I’m thrilled to announce that NYT Bestselling novelist Michael Palmer will be in the Handbasket! I love Jim Thompson! The bio on him was fantastic — I think it was called The Savage Art of Jim Thompson or something to that effect. I always use his definition of plot — things are not what they seem . . .
Hey, sweet Michelle. I’ve wanted to read that bio for the longest time. Robert Polito won an Edgar for it. Must order it right away. Thanks for the reminder! Hi, Danielle. I hope they have plenty in stock. Definitely start with his earliest–The Killer Inside Me, preferably. But I also like The Transgressors and The Getaway and there’s After Dark, My Sweet. So many choices!